The UF Health Proton Therapy Institute (UFHPTI) has treated more than 650 adolescents and young adults and 1,600 children. It has the largest pediatric proton therapy program in the world, serving, on average, 25 children per day. 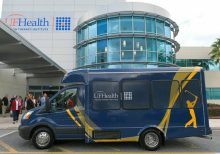 Now, the institute has a new 14-passenger shuttle bus to transport patients and their caregivers – primarily children and their families staying at the Ronald McDonald House – to and from their daily treatments, thanks to THE PLAYERS Championship. UFHPTI received the gift from THE PLAYERS Championship on September 26 during the organization’s annual Red Coat Ride Out. An additional $5,000 donation from THE PLAYERS Championship will enhance the social programming for adolescents and young adults who are being treated for cancer. THE PLAYERS was among the early donors who made the UF Health Proton Therapy Institute possible. Since opening in Jacksonville in 2006, more than 7,700 patients have walked through THE PLAYERS Championship lobby at the UF Health Proton Therapy Institute. Read more about the organization’s generous gift to UFHPTI here.